You Can Almost Always Shoot Hand Held. But Should You? Modern digital cameras offer a range of capabilities that allow hand held shooting in low light situations. You can crank up the ISO to astronomical levels and shoot hand held in just about any light, providing you can tolerate the noise level this creates. If you can afford a wide aperture lens it will deliver more light to the sensor for a faster shutter speed. Shooting in RAW rather than jpeg allows a wide range of exposure correction. Hand held photos can be brought to life even if they are severely under exposed. With today’s equipment it is possible to shoot hand held in just about any light. So does all this mean that the tripod should go the way of the buggy whip? Not by a long shot. Camera stabilization offers an expanded world of photographic opportunity not possible with a hand held camera. Obvious examples include moonlit landscapes and star trails. Urban street scenes take on an added artistic dimension when long exposures record streaks of traffic trails. Night scenes can benefit from bracketed multiple exposures merged into a single shot with HDR software. Camera stabilization is preferable here to maintain alignment and avoid blur from camera shake. Night photo of Vernazza, Italy. One half second exposure, camera mounted on HandlePod. Even night scenes that are reasonably lit can benefit from a stabilized camera. The scene at right could have been hand held with the proper settings. But a low ISO and shutter speed of one half second on a stabilized camera produced good results with no hint of camera shake. Even if the scene is bright enough to be shot hand held, it is best to provide some sort of camera stabilization to avoid the possibility of blur. Shooting hand held or stabilized should not be a choice of one or the other. For maximum photographic versatility, both should apply–hand held in daylight and stabilized when the sun goes down. The best equipment is a sturdy tripod. But what if a tripod isn’t available? There are other approaches to night photography without a tripod. A pocket size tripod alternative like HandlePod will do the job in a variety of situations. 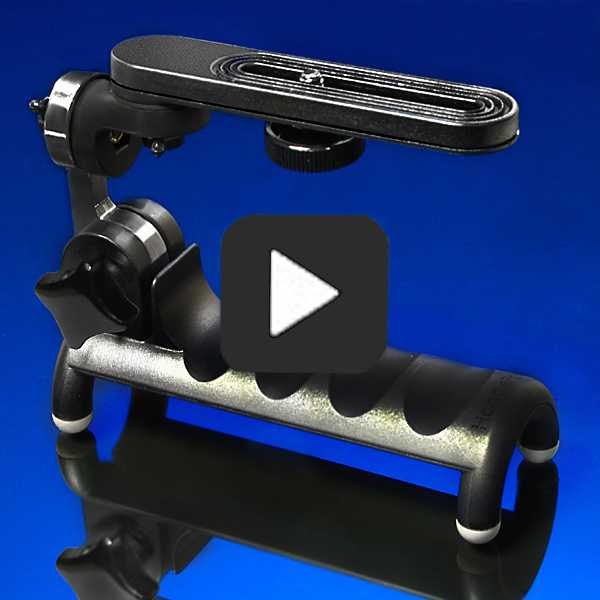 While not as versatile as a tripod, it will provide reliable stabilization on any available solid support. This entry was posted in Tripod Alternative on May 18, 2016 by main user.